The Employee Scheduler for Excel is an affordable spreadsheet template for scheduling hourly employees and managing labor costs as a percentage of sales. The Employee Scheduler for Excel and OpenOffice was developed by the owner of a small quick service restaurant in the U.S.A. for controlling labor costs which is key to survival of a small business. The Employee Scheduler for Excel and OpenOffice is a very simple, easy way of managing labor costs on the weekly employee schedule. 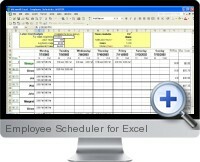 The Employee Scheduler for Excel and OpenOffice is a simple spreadsheet you that produces weekly employee schedules. It is designed with the small business in mind. It doesn’t have a lot complex features, and is intended to bridge the gap between doing schedules manually and spending hundreds of dollars on a scheduling system. The Employee Scheduler for Excel and OpenOffice also allows managers to manage hourly wages as a percentage of sales by calculating how many hours are available to schedule.